All homeowners and residents are encouraged to attend. April. Details are also posted in the monthly Board Newsletter and listed on this event page. 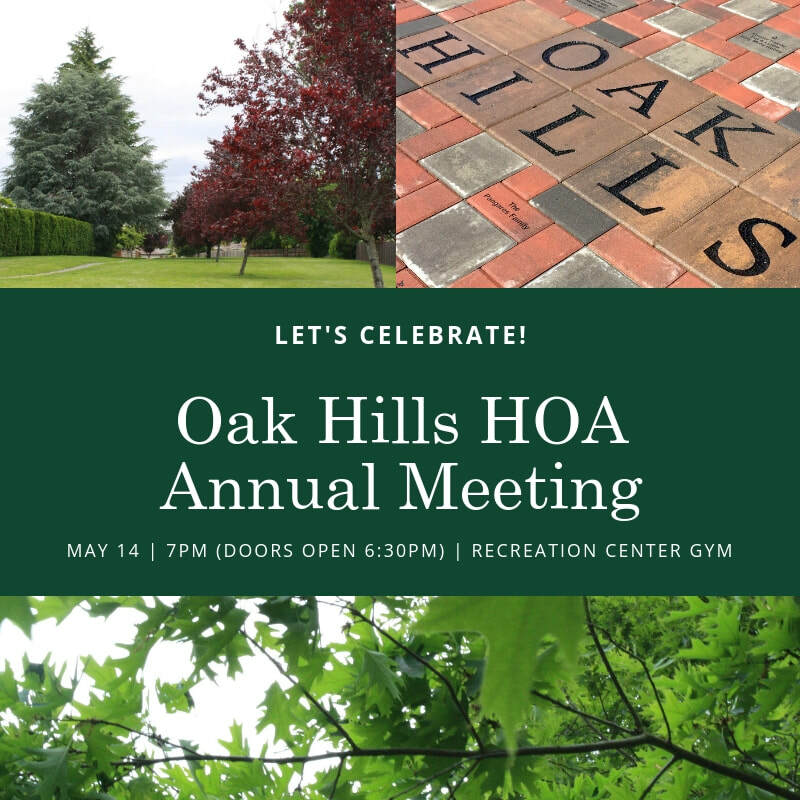 The Oak Hills Homeowners Association Annual Meeting is held once a year for all homeowners and residents to attend. At this meeting, three new Board directors will be elected and any other items of business that require a vote by members of the community. Additionally, Board Directors will provide department updates and homeowners are invited to ask questions or address the Board during an open forum. The following are two items that require a vote of the homeowners at the Annual Meeting. ​Homeowners may vote in person at the meeting or by directed proxy ballot (see below for details). At the Mar. 6 Board Meeting, the Board of Directors approved the proposal of an annual homeowner dues increase of $150 for the fiscal year beginning October 2019. If passed by a majority vote (two-thirds voting in favor) of attending homeowners and proxy ballots at the Annual Meeting, homeowner annual dues will be $700 per year going forward. This figure was determined by dividing the annual operating costs ($458,250) by 650 homeowners. If passed at the Annual Meeting, homeowner dues will fully fund the current level of operations for all services provided to homeowners: Recreation programs (pool, gym, etc. ), current staffing, maintenance of common areas and buildings, website and newsletter, Architecture Review Board (ARB), Compliance, Community Affairs, etc. Financial documents are posted on the Financial Information page. Each year the terms of three OHHA Director positions expire at the Annual Meeting. This year includes Directors: Sheila Brewer, Terri Danowski, and Linda Marshall. Sheila Brewer and Terri Danowski have accepted nominations to run for additional terms. Jana Carlson and Gerry Reeve have also accepted nominations to run for a term on the Board. Nominations will also be accepted from the floor at the meeting. The Bylaws state that each owner entitled to vote may do so “either in person or by agent or agents authorized by a written proxy.” Therefore, in accordance with Article IX (b) of the Bylaws, an owner MUST be present at the meeting in order to vote. If an owner is unable to attend the May 14th meeting, he/she may assign their voting rights to another person by way of a directed proxy (enclosed) to vote in their place. The person holding a directed proxy shall vote in accordance with the directions given in the proxy. It's easy to cast your vote: complete the Proxy Ballot and give to a neighbor attending the meeting. Proxy ballots must be received in the offices of CMI by May 13, 2019, or presented at the Annual Meeting sign-in. Click here to download the 2019 Proxy Ballot (also mailed to homeowners from CMI in April). Please contact Nancy La Voie at CMI (503-445-1102, nancyl@communitymgt.com). 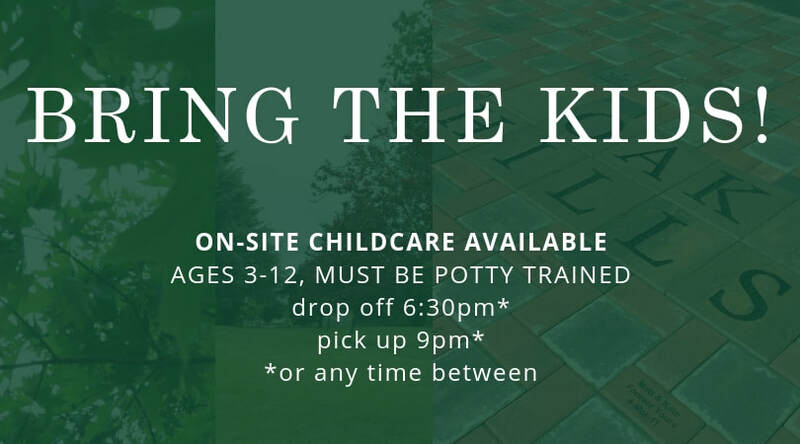 Childcare open (Community Room) – until 9 p.m.